The mid-range BFG is an easy-to-use, affordable force instrument. 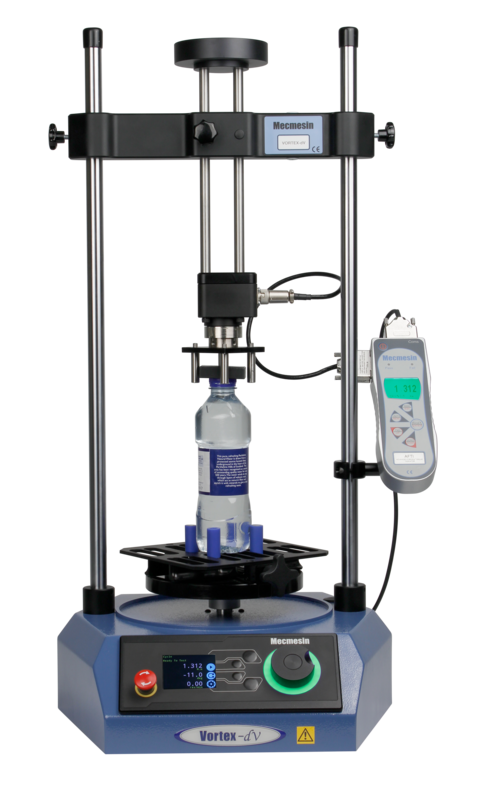 It can be used handheld or fixed to a manual or motorised test stand for excellent testing performance, providing consistently accurate force measurement. 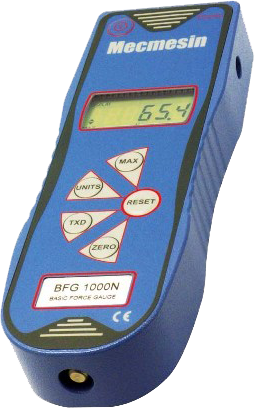 For improved accuracy and additional functionality, have a look at the Advanced Force Gauge (AFG). The BFG can be used with a wide range of grips and accessories. 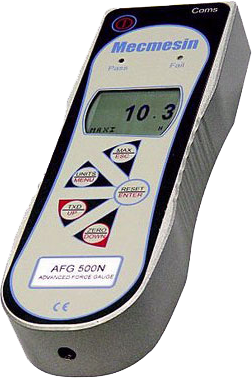 The top-of-the-range AFG is the most accurate digital gauge in the world. For added flexibility the AFG is able to recognise data from an range of external ‘plug and play’ force or torque transducers. 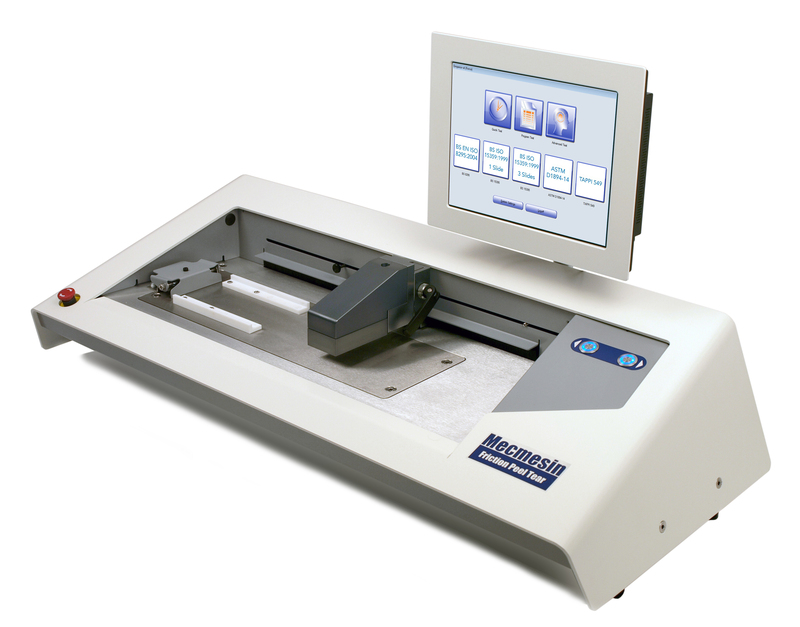 The MultiTest –dV provides outstanding value as a superior, motorised force tester. It is suitable for tension and compression applications up to 2.5 kN. Designed for precision-controlled compression and tension testing, its simple controls, backed by sophisticated electronics, make it the ideal choice for a wide range of routine testing. Add any one of the Mecmesin range of Advanced Force Gauges (AFG) for controlled testing to a load limit or break. Our extensive range of grips and accessories make this a highly versatile and affordable solution, which will provide consistently reliable performance. Add VectorPro™ Lite software to a MultiTest-dV with AFG, for data acquisition, reporting and exporting, graph plotting, results calculation, and storage of regular test routines. 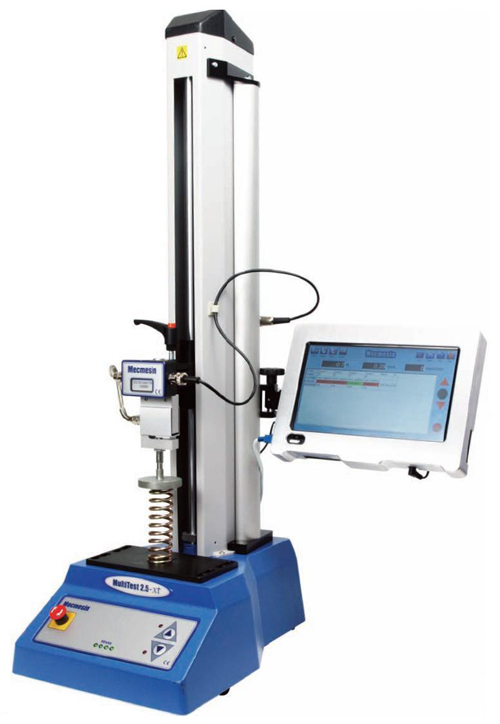 The OmniTest™ range comprises four bench-mounted, static load testing machines allowing tensile and compressive forces to be applied to a wide variety of material properties, specimen configurations and test types. All frames feature excellent rigidity with minimal deflection, upper and lower safety limit switches and have ample space to accommodate most sizes of test specimen. Outstanding motor control delivers an impressive speed range from as slow as 0.001 mm/min right up to 1200 mm/min. Choose your OmniTest bench-top frame to apply loads – from 5 kN to 50 kN capacity. Select from the ELS range of precision, interchangeable load sensors to record applied loads. To hold your specimen add suitable grips and fixtures from our wide collection. Easily configure VectorPro™ MT software to meet your own specific test methods. Enhanced Load Sensors with excellent accuracy across the load range. Active load holding and rate control (load ramping), plus active strain control. Just four multifunction buttons for settings and operation. Clear indication of load, displacement, speed and system status. Rigid frame with minimal deflection, lightweight construction, integrated cable management. For unlimited tensile testing, compression testing and analysis capability. 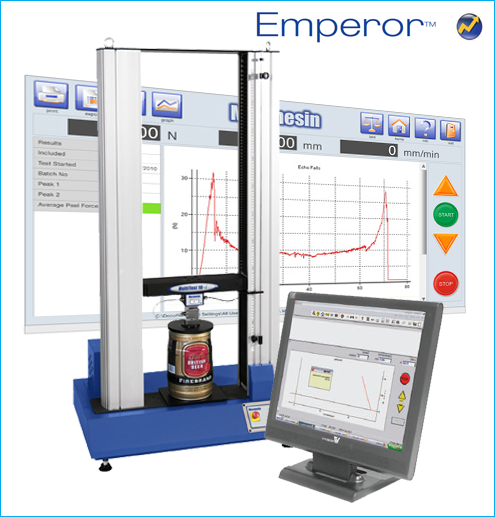 Use the power of Mecmesin’s Emperor™ software to control your MultiTest-i compression and tensile test system. 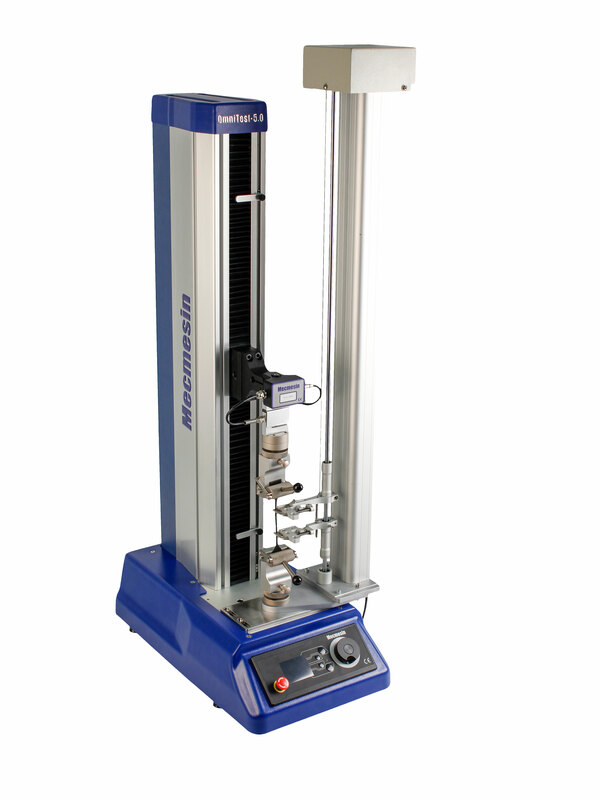 With our top-of-the-range MultiTest-i tensile test and compression test systems you gain full programmable control and comprehensive evaluation tools for performing a vast array of tension testing and compression testing. The MultiTest-i frames below are used in conjunction with our comprehensive range of intelligent loadcells (ILC), which have automatic recognition of calibration data and are easily interchangeable to suit the load you wish to measure. Excellent resolution and outstanding accuracy come as standard. A semi-automatic force measurement solution, ideal for routine testing on the production floor. 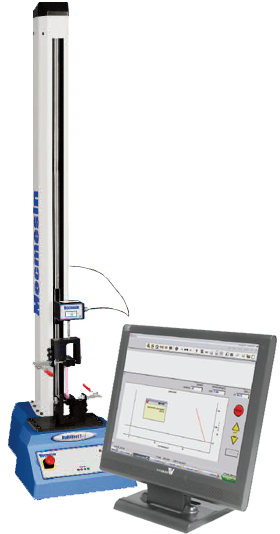 Used directly within the manufacturing environment, the MultiTest-xt tensile tester requires minimal training to begin performing quick, accurate in-line production tensile tests, with the press of just two buttons. Clear colour-coded pass/fail indicators allow smooth, efficient quality control checks, whilst a range of calculations provide ample data interrogation options. Single and twin column stands covers the range from 1000N up to 50,000N. ‘favourite’ frequently used tests for fast tensile test initiation. 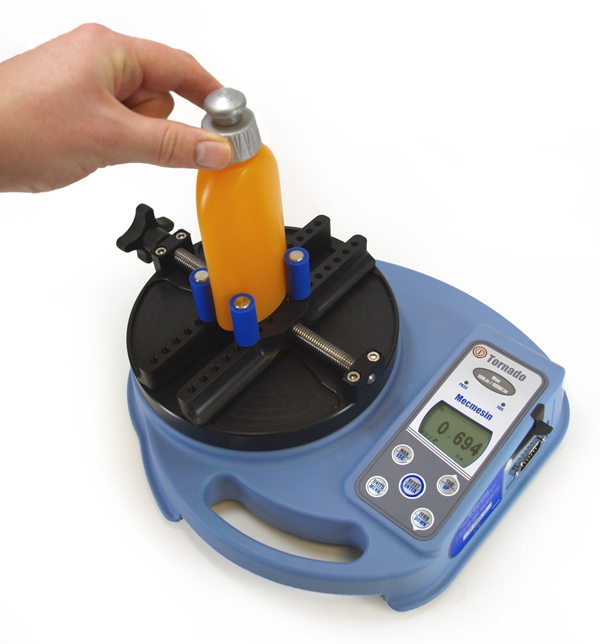 intuitively learn to use the tensile testing equipment. stored or exported to Microsoft Excel® or SPC packages. accidental changes to test programs. analysis and reporting via USB or wireless network. Use the Vortex-i range for unlimited testing and analysis capability. Optimised for measuring static and rotary torque up to 10N.m, the versatile Vortex-i is ideal for running sophisticated routines for more demanding product and material tests. With our top-of-the-range Vortex-i systems you gain full programmable control and comprehensive evaluation tools for performing a vast array of torque tests. Vortex-i systems are used in conjunction with our comprehensive range of intelligent torque loadcells (ITC), which provide automatic recognition of I.D. and calibration data and are easily interchangeable to suit the load you wish to measure. Excellent resolution and outstanding accuracy come as standard. The Helixa is designed for precision design applications, where torque forces may be very small and where accuracy is paramount. Its counterbalancing mechanism allows the removal of axial force, whilst also enabling the application of precise top-load or tensile force when required. The drive spindle can be user-aligned for precise concentricity with the intelligent torque cell. Our experienced engineers can design and manufacture custom fixtures for your specific sample profiles. The Helixa accepts interchangeable intelligent torque cells for measurement from just a few mN.mm up to 6 N.m, with a resolution of 1:65,000 and an accuracy of ±0.5% of full scale. – For specific precision applications, experienced Mecmesin engineers can work with you to advise, adapt, or design and manufacture custom fixtures. – Helixa-xt is controlled by Emperor-xt, designed especially for intuitive touch-screen use requiring minimal training for repetitive use. It also has easy-to-use results calculation, reporting and exporting, and can run full Emperor programs created on PC. The FPT-H1 is a dedicated horizontal tester, designed for testing to all the key industry and international standards for coefficient of friction, and for appropriate horizontal peel and tear methods. Its sleek contemporary styling incorporates ease of use and maintenance. Built to exacting standards, yet affordable, the FPT-H1 provides the most accurate and detailed measurement, with guaranteed repeatability in testing. It is ideally suited for the packaging industry, for manufacturers, converters and users of paper, board and plastic films, plus coatings, floor coverings and textiles. 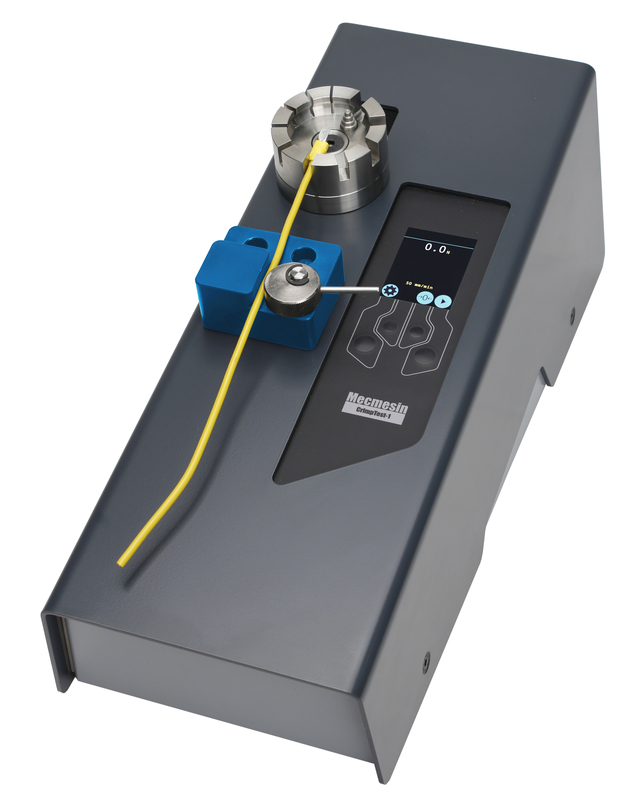 – A choice of loadcells, 10 N, 100 N and 200 N, to give the flexibility to match the capacity to the test force range for optimum results measurement. The FPT-H1 can be specified with the ISO 15359 COF kit, which provides a mechanised placement and lift of the 800 g sled, as required by the standard. The fixture also ensures a linear slide during the dynamic slip phase by means of its friction-free guide rails. Designed for the packaging, wrapping and laminating market, FPT-H1 may also be fixtured to become a convenient push-button horizontal peel tester. Amongst the 90°, 180° and T-peel standards supported are: FINAT 1 & 2, AFERA 5001, ASTM D3330, ASTM F88, ISO 8510-2 Part 2. The driven moving table fixture used for 90° peel and adhesion testing ensures a consistent right angle between the peel direction and the substrate. Designed for the plastic film, paper and textile industries, FPT-H1 assesses packaging material strength, welded joins, folds, creases and perforation lines for tear resistance. The following standards may be addressed: ASTM D1938-08, DIN 53363, ISO 34-1, ISO 6383-1, ISO 12625-12, ISO 13937, ISO 11897. Grips can easily be fitted to perform single trouser tear tests, trapezoidal and Winkelmann/Graves style tests. The FPT-H1-i is delivered with the powerful Emperor™ programming software and contains the pre-programmed routines found with the console version. The CrimpTest-1 kN is a horizontal, motorised wire terminal tester, designed for ease of use, rapid throughput and high duty cycle operation. Rugged construction, simple controls and a clear display make this compact, benchtop unit an ideal quality checking instrument for wire terminal manufacturing equipment, right at the point of production. Clear indication of pull-off load and pass/fail status. 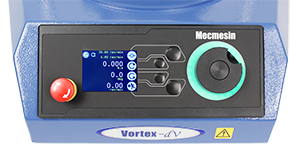 For Vortex-dV and Mecmesin digital instruments (Tornado, Orbis, and AFTI). VectorPro™ Lite enables the same basic test routines that are available through the Vortex‑dV panel controls, to be set up and stored on a PC, with their settings, for re-use. Any single test routine can be uploaded from VectorPro™ Lite to the dV test stand, and can be run from the software to provide real-time torque/angle/time plotting. from a menu of compatible Mecmesin testing equipment. programme to guide you whenever you need. 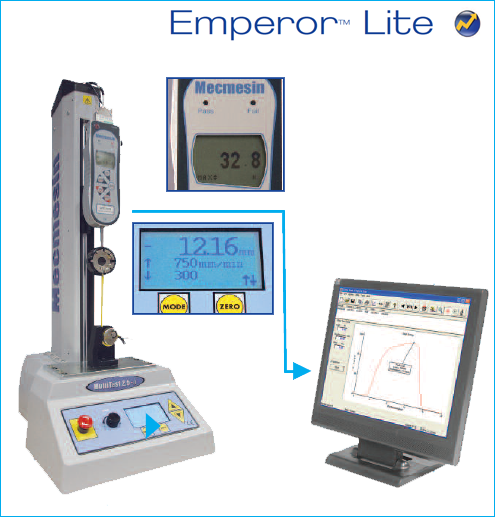 Emperor works exclusively in combination with Mecmesin’s top-of-the-range MultiTest-i force and Vortex-i torque testing systems. From simple routine tests to sophisticated multi-stage tension and compression procedures and analyses, quality professionals are guaranteed the ultimate in flexibility, accuracy and consistency. library and tailor it to suit your requirements.